Comic Twart: COMIC TWART @ HEROES CON this weekend! COMIC TWART @ HEROES CON this weekend! From the HEROES Con Panel Schedule: The comictwart.com site has become one of the more popular sites online for fresh weekly comic art. Join “twartists” Tom Fowler, Chris Samnee, Francesco Francavilla, Ron Salas, Declan Shalvey, and Andy Kuhn, with moderator Chris Sims of Comics Alliance , for a discussion and multi-sketch demonstration. All sketches to be donated to the HeroesCon Art Auction! Does anyone have any suggestions of characters to draw at the panel? Let us know by leaving a comment! 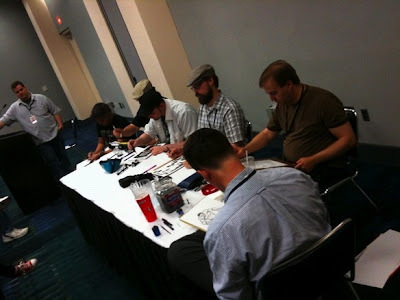 UPDATE: Check out the sketches from the panel by clicking HERE courtesy of Comics Alliance! How about a little pulp action with Doc Savage, the Green Hornet and Kato, the Shadow or the Avenger. I know everyone already did their frazetta tributes online but he was pretty awesome. It would be rad to see everybody on stage doing frazetta tributes simultaneously. Plus since the sketches will be going to charity I imagine lots of people at the auction will want a piece of art commemorating the year frazetta died... maybe I'm just biased because I know I would. James bond. Give each artist a different actor. I'd personally go pulp as well and vote for "The Shadow", "The Phantom" or "Doc Savage". But I'd also love to see everyone's take on "Frankenstein", "Dracula" or "Sherlock Holmes" (who I've had a couple of you do already). Either way, I'm sure all of us who can't make the convention would love to see pics of whatever the topic is. Wish I could be there! You guys are going to do awesome. Ditto from this Mitch! Really wish I could have made it out there if only to look better by association! Have fun tomorrow, kids! Could not be more jealous of the guys getting to go, and all of you folks who get to see it. Have a great time everybody! You guys haven't done Superman yet I don't think. That could be good. Somebody iconic that can be interpreted a bunch of different ways is the best. they didn't post my second LUKE CAGE sketch, i think it was better. That was such a great panel. I hope it happens again next year.